You will never be short of things to do on and around the island of Kos and there is always a beach to relax on. On average visitors to Kos book seven (7), ten (10), or fourteen (14) day stays. Our staff are always happy to make recommendations, suggest activities, alternatives, and help you arrange your days out. 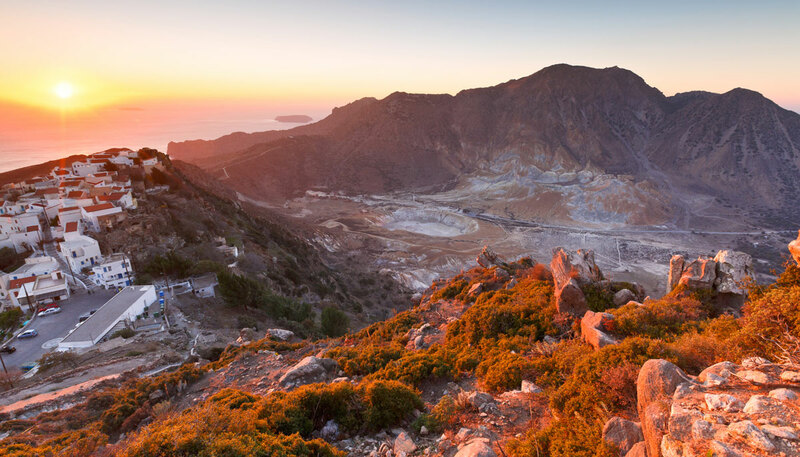 We can guide you with the essential Kos experiences mentioned here. Depending on how much time you have with us, we suggest one excursion if you are here for 7 days, two if ten days and all three if yours is a two week stay. This is by far the most unusual yet attractive destination. The volcano island. 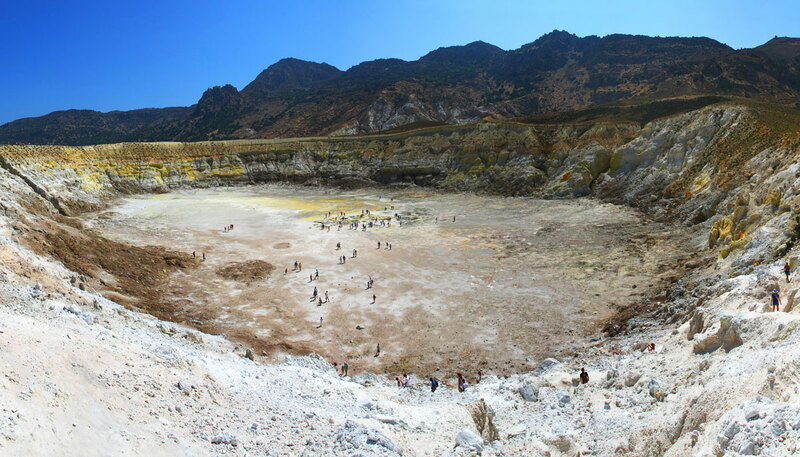 You will take a 45-minute crossing from Kardamena to Nysiros harbor from where a bus will take you to the volcano which will feel like a moon landing. Bubbling mud pools and steam geysers, the ground you walk on is hot and you can imagine the lava beneath. A visit to Panagia Spiliani a beautiful monastery is also included in this package. Mandraki town is very scenic with traditional architecture and with blue and white houses. Transfers to Kardamena and back are included in the package. 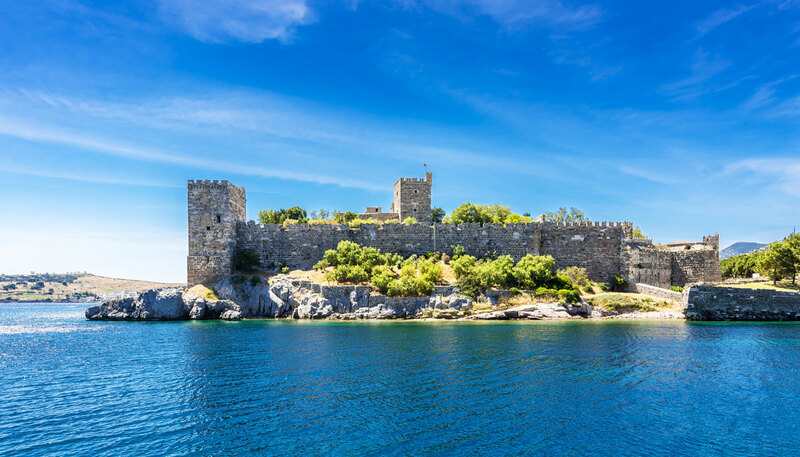 A fifty minute crossing will take you to the beautiful harbor of Bodrum with its imposing castle. An hour long bus tour will take you to local attractions like the windmills and the ancient Greek theater. The rest of your time is free to do as you please. If you like history we recommend a visit to the castle, or the museum of underwater antiquities, with impressive shipwrecks. 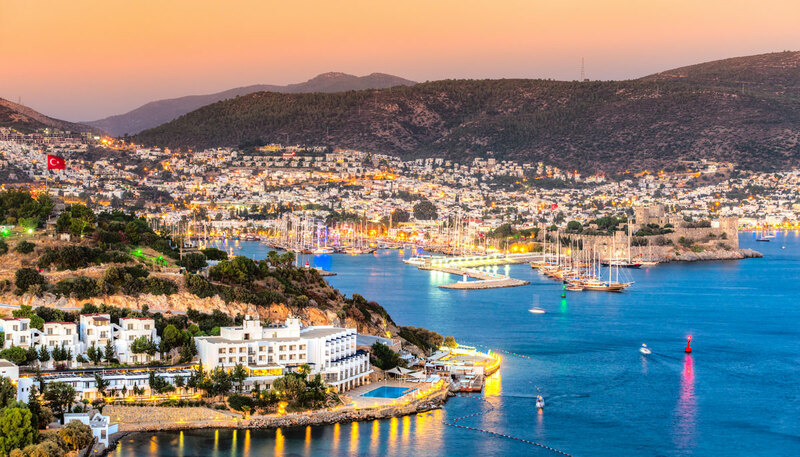 For most a stroll through the sokaks (small streets) is a highlight, you can enjoy traditional Turkish cuisine, or use the bazaar visit to bargain for a plethora of genuine and touristic items. Transfers to Kos town & back are included. This excursion involves border crossing & passport controls on both sides. The fun cruise will take you island hopping where you will have the opportunity to swim in private coves and enjoy the day on the water, with three island stops. 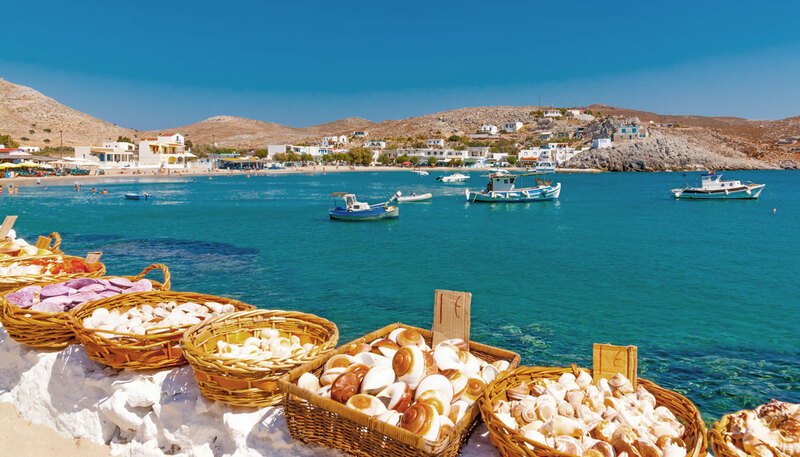 An hour sail out of Kos will take you to Pserimos. The island has 60 locals, you can enjoy a stop at a local café or a quick dip in the local sandy beach. Next stop is the small island of Plati where lunch is served by the crew prepared while you enjoyed a swim from the boat. 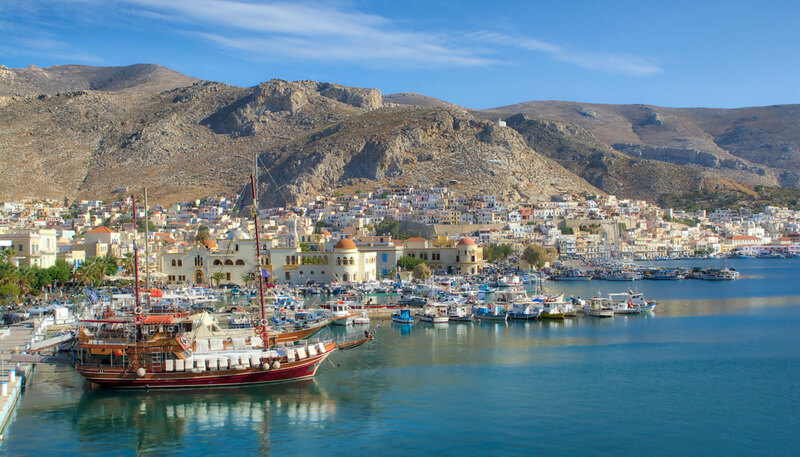 Pothia at Kalymnos is perhaps the most colorful town of the Dodecanese with a medley of colorful homes. 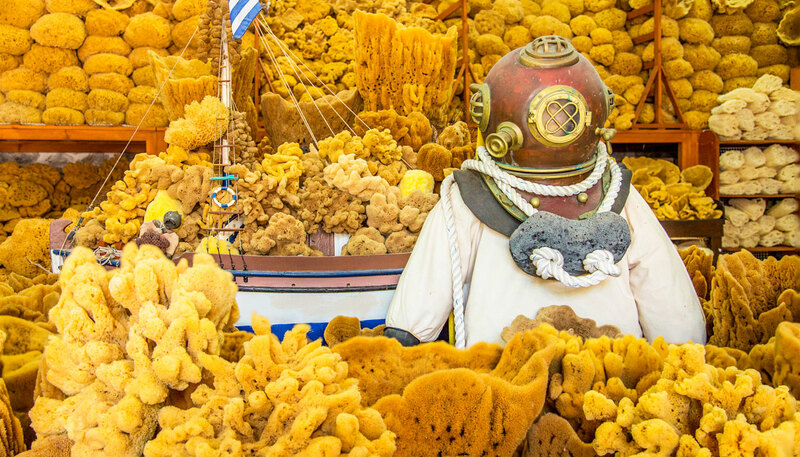 Visit a sponge factory or the sponge diving museum to learn about this local trade. Time to shop or walk about before the return to Kos. Includes transfers to Kos and back to Marmari.